"In which state did the sweet-dish Rasgulla or Rasagola originate?" If you answered- Odisha or Orissa, then full marks to you. Many do not know the birthplace of the Rasagola. The popular perception is different. On learning this, some get emotionally charged up, some others feel it is funny, while many disbelieve. Actually, Rasagolas have been associated for centuries with the Shree Jagannath Temple, Puri in Odisha. The last day of the Rath Yatra, called Niladri Bije, is the only day when Lord Jagannath is offered Rasagolas as prasad by His devotees. Also, Lord Jagannath Himself offers Rasagolas to please His consort, Maa Laxmi. The Lord gifts Rasagolas to Maa Laxmi to gain entrance into the Temple. Niladri Bije is an important day of celebration - the last day of the Rath Yatra marks the entry of the Gods to the Temple after their trip. Also, Rasagola magic helps open the Temple's gate for Lord Jagannath! No doubt it's a Sweet Yatra! This is a special year as it is the year of the Nabakalebara that is taking place after 19 years. This year Niladri Bije is on July 30th. We are celebrating this day as Rasagola Dibasa- a day dedicated to Rasagolas. In Odia language, Dibasa means day. #RasagolaDibasa is on Niladri Bije! We have celebrated #PakhalaDibasa on 20th March and #UtkalaDibasa on 1st April. 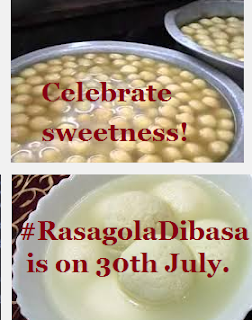 Now it's time for #RasagolaDibasa! 1. Celebrate Niladri Bije- the centuries-old Puri Temple custom and the ritual of Lord Jagannath! 2. Celebrate sweetness! The sweetness of Rasagolas bridges barriers between the Lord and His wife! With Rasagolas, we can befriend even enemies! 3. Celebrate Friendship! July 30th is also the International Day of Friendship. Share Rasagolas as Friendship Day gifts! The birthplace of Rasagola is Odisha. Rasagolas originated in Odisha. 5. Variety is the Spice of life! Get to taste a large variety and get introduced to more types and tastes of Rasagolas! In Odisha, there are a mind-boggling varieties of Rasagolas - there are variations in the name, shape and colour depending on the place of origin. If the Government or private organizations set up Rasagola stalls in Melas/Fairs, everyone can get to taste or sample a large variety in one place! 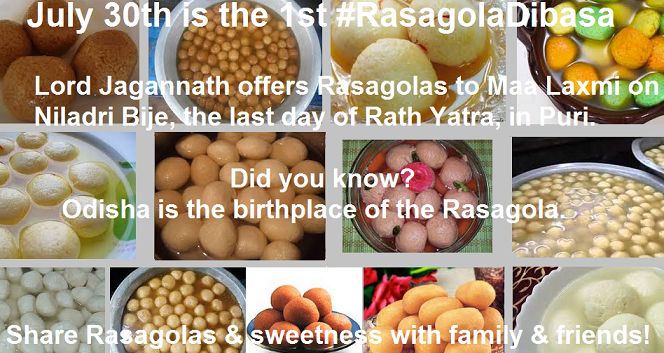 I can add more reasons, but #Rasagola itself is the main reason for #RasagolaDibasa as it's the sweet attraction! #RasagolaDibasa is a valid reason for us to savour Rasagolas! This delicious 'King of Sweets' deserves a day for it! And Odisha certainly deserves credit for this sweet. 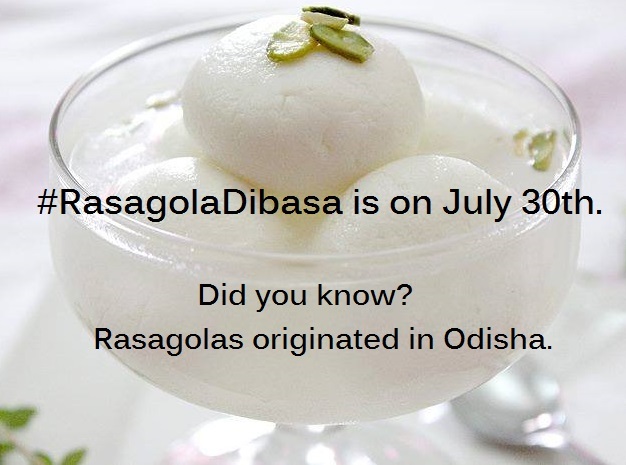 Looking forward to celebrate the maiden #RasagolaDibasa this July 30th. Thereafter, as per popular support, we'll be celebrating #RasagolaDibasa every year. Only when people are informed, they will be aware and can participate in the celebration. Mark your calendar for July 30th! Do share this info with all your friends and forward in WhatsApp, email, and other Social Networking sites like FB, Twitter etc. Cheers to Rasagola & to all its lovers! Do checkout all my Rasagola and Rasagola Dibasa posts here. Linda, the Rasagola is an amazing sweet-dish or dessert. Round dumplings are made from Chhena (Indian cottage cheese - freshly made out of milk) and semolina dough. These balls are cooked in sugar syrup till the syrup permeates them. They are had hot or cold. You must taste Rasagolas to experience them! I know what gift to carry for you when I visit you- a can of "Bikalananda Kar" Salepur Rasagolas of Odisha! Yes, many are not aware of this fact. Odisha is indeed the place of origin of Rasagolas. You must visit Odisha. You will be amazed to capture the pics and taste of the large variety of Rasagolas found here. So, when are you visiting Odisha? Do let me know. I love rasgullas.. Interesting n informative post! I love them too, Meera! Woah, I always thought rosgullas were a Bengali thing! Thanks for correcting my impressions! And happy rasagulla dibasa to you too!! Thanks! Happy Rasagola Dibasa to all of us! A sweet post in every sense, Anita! Thank you so much, Rahulji! I read your updates about it. Good to know more about this sweet delicacy. This will be the maiden celebration of the #RasagolaDibasa to mark the special occasion of the Niladri Bije of this Nabakalebara Ratha Jatra. Some sweet-shops in Bhubaneswar & Pahala in Odisha are celebrating it. Thanks for your maiden comment & appreciation! Do visit Odisha & have the finest & freshest Rasagolas available here. Meanwhile, will send some e-Rasagolas for you! Exactly. 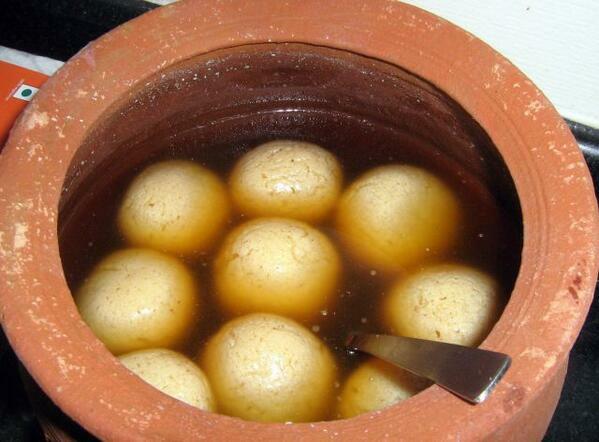 Many people don't know that Odisha is the birthplace of the Rasagola. Hope everyone learns the truth soon and Odisha earns her rightful credit for this delectable sweet. Thanks for your appreciation :). A very happy and sweet #RasagollaDibasa to you Anita. Like your posts highlighting he culture of the state. I like the flight ready packing they make for people to carry them out of Odisha. Btw you may like to read to read a post that I had written titled Baliyatra – commemorating ancient maritime traditions. Thanks a lot :) Happy #RasagolaDibasa to you too, Somali! Yes, hope we have more packaging & distribution of the Odisha Rasagolas worldwide so that people get to experience the original taste. Many have this wrong perception. Do visit Odisha & taste the authentic Rasagolas from Odia sweet-shops. Wish all people are more informed and aware. #RasagolaDibasa is a humble effort from all of us to share the truth & sweetness this Nabakalebara Ratha Jatra. Thank you so much for your sweet & encouraging words, Sreesha! The #RasagolaDibasa idea is simple. Hope everyone becomes aware of the centuries-old Puri Temple ritual & Odisha gets her rightful deserving credit for his amazing creation. We celebrate sweetness & friendship. Mouthwatering post! I would have failed your test thought and get a big sweet zero! But now I know better! Today, on #RasagolaDibasa, we are finding connections of everything with Rasagola! Even zero is a circle like a Rasagola! So glad that now you know, Mridula. Do visit Odisha. Waiting for you to capture her beauty. And of course the Rasagolas & other treats await! Wow I never thought anyone could have written a whole post on Rasagolas :)! I didn't know they originated in Odisha. But have seen an amazing variety being sold at Pahalo a small town that lies between Bhubaneswar and Cuttack. Do visit Odisha for great quality & a large variety of Rasagolas. Great post with yummy pics. So, Rasagolas have a whole day dedicated to them. :) That's so sweet. Many feel the same, Ashwini. Yes, let the reason to celebrate be love! WISHING ALL ODIA AND OTHER INDIAN BRETHREN* A VERY HAPPY RASGULLA DIWAS! *EXCEPT PAROCHIAL BONGO SAVAGES WHO TRIED TO STEAL CREDIT FOR ODIA CULTURAL ICONS. SPECIAL GREETINGS TO ANITA FOR ALL HER EFFORTS. WE ARE PROUD OF YOU!